For some people the idea of leaving anything unfinished is both stressful and unacceptable. To others it seems to be a common things, and they find themselves bouncing onto the next project without finishing the previous one. 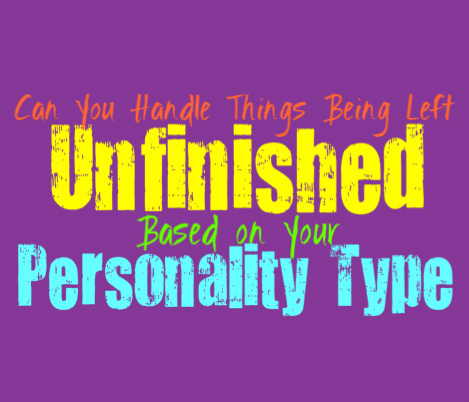 Here is how you handle having things left unfinished, based on your personality type. INFJs can become uneasy when something is left unfinished, or they have a project or chore hanging over their heads. At the same time it can be challenging to finish everything, especially if they have a lot on their minds. INFJs simply don’t like feeling the distraction of having something they need to finish, and would rather just get those things done and out of the way. They do their best to maintain a balance and really don’t like the feeling like they haven’t finished something properly, or even to a certain level of perfection. ENFJs really don’t enjoy having anything left unfinished, especially since they are perfectionists. If they feel like something hasn’t been completed, this will likely hang over their head for a while. For the ENFJ being able to finish all of their chores and projects perfectly, is actually very important to them. When they have something they know needs to be completed they find themselves often thinking about this and stressing about it until it is finished. For INFPs something being left unfinished isn’t always a big deal, it entirely depends on the project or chore. If it is something they have lost interest in, the INFP finds that it is more valuable to move onto something which inspires them. They become especially distracted when they have chores or errands which are required of them, and find themselves sometimes struggling to really finish these tasks. INFPs become bored easily and this can cause them to leave some things unfinished. ENFPs do have a tendency to leave some things unfinished, mostly because they get distracted by something more interesting. ENFPs become bored fairly easily and don’t like being stuck in the same place for too long. When they find themselves drawn to something new, the ENFP won’t be afraid to move on to where they feel inspired. Sometimes this causes them to leave things unfinished, but this doesn’t bother them unless they feel it is a necessity to get it done. INTJs definitely aren’t fans of leaving things unfinished, and prefer to complete their projects or tasks. When they begin something they are often fully aware of how to finish it, and they will work until they make it to completion. For the INTJ simply giving up on something feels like a major failure, especially if it is from laziness or loss of interest. They make sure they can finish something once they start it, and will not be comfortable with any projects left unfinished. ENTJs are highly unlikely to leave projects unfinished, especially any important ones. They don’t like just moving on without making sure they can get things done accordingly. ENTJs are hardworking people who believe in efficiency, and strive for a sense of perfection in their work. When the ENTJ starts something they have every intention of finishing it, and can even become a bit anxious if something is left incomplete for too long. They believe in always striving for the best in their efforts, and won’t settle for anything less. INTPs do have a tendency to leave certain things unfinished, since they become distracted. INTPs will often have plenty of different tasks and projects going at once, and find themselves constantly bouncing around to new things. This happens because the INTP can become bored of something rather quickly, and feel the need to explore something more interesting and challenging. Their minds are constantly bouncing around from one things to the next, and so sometimes things just get left unfinished for a while. ENTPs really don’t mind having some things left unfinished, especially since they have a tendency to bounce around a bit. Their minds are often drawn in many different directions, and they don’t like holding themselves back from experiencing this. When the ENTP becomes bored of something, they will likely search for something new which will challenge and inspire them more. This causes the ENTP to have plenty of projects and tasks which are unfinished, but they will likely try to go back to them later on. ISTJs really don’t handle unfinished projects or tasks well at all, and prefer to get things done. While they value being efficient and perfecting their accomplishments, ISTJs also want to be sure to get them done in a timely manner. Simply letting things drag out and waiting for a long time to finish them, is actually stressful for the ISTJ. They want to get things done and when something is unfinished it often hangs over their head. For the ESTJ having things unfinished can be really stressful for them, and these tasks or projects will hang over their heads. For the ESTJ it is important to get things done efficiently but this also means they need to finish them quickly. They value being able to push themselves to finish their tasks and projects, and when they are done they will feel a powerful sense of relief and accomplishments. For the ISFJ having things left unfinished often feels like they are failing in a lot of ways. They believe in working hard to get things done and push themselves to accomplish their goals and projects as quickly as possible. At the same time ISFJ want to be sure they are finishing each tasks with a sense of efficiency and near perfection, and so this can be challenging for them. ISFJs often put a lot of pressure on themselves, since they hold a lot of responsibility in their hands. For ESFJs having unfinished projects is actually really stressful, since they work hard to get things done. When they have certain things they need to finish, these tasks will often hang over their head until they are done. They will constantly think about these different errands and projects, until they actually find the time to finish them. For the ESFJ it can be challenging since they take a lot upon themselves and work hard to provide for their loved ones. ISTPs don’t often mind if they leave certain projects unfinished, especially if they aren’t all that important to them. They find themselves distracted fairly easily, and so they would rather go with what they feel most excited about. While ISTPs will want to finish certain things which are important to them, they don’t become overly stressed about it. They don’t like allowing themselves to become overwhelmed by things that they have yet to complete. ESTPs do often have unfinished projects and tasks, since they can find themselves bouncing around from one thing to the next. They sometimes become distracted and procrastinate, even with the things they really want to get done. This does sometimes stress the ESTP out, but at the same time they struggle to complete things until the very last minute. They might even find certain things go unfinished for a long time, if there are no deadlines to force them to get it done. ISFPs do often find themselves leaving things unfinished, especially when they become bored of it. They do often feel like their work is unfinished, and they might leave it this way for a long time. While ISFPs can become bothered by having too many things unfinished, their minds simply become distracted and bounce from one things to the next quickly. It can be challenging for them to maintain focus, since they are inspired to dive into new things. ESFPs do often have unfinished tasks and projects, since they find themselves distracted so easily. They become bored of things and often want to move on to something new which excites them more. For ESFPs this causes them to leave so many things unfinished, because they become tired of those tasks or projects and want to find something that has that thrill and excitement they are searching for.